How to use a 61-keys digital piano? Yesterday I bought a Casio CTK-1200 keyboard. It was listed as a digital piano on Amazon, but it is really a keyboard I guess. Anyway, when I pressed couple keys it didn't really sound like the sound of a real piano. The problem is that I've never used a keyboard before or learned music. So I'm a COMPLETE beginner and I have absolutely no idea how and where to start learning. I can't afford a teacher of course since I'm a poor student, so I need to learn alone. My main purpose is to learn how to play piano. So I bought this cheap keyboard to learn how to play in general for one year and then probably upgrade to a decent digital piano. I tried Google and YouTube and then I found this; however it assumes having an 88-kes piano. But I only have 61 keys, so I'm not sure what to do. I also have no idea what chords, tempo, rhythms, etc. are. Can you please give me good places to start learning? Tutorials ... etc? Or even proper Google terms since I'm not a native English speaker. Also a tutorial that demonstrates the features of a keyboard like mine or a digital piano. For the high notes (ottava 6), there's not much you can do. Only if it's an isolated figure that is only played there, you can simply shift it by one ottava down. 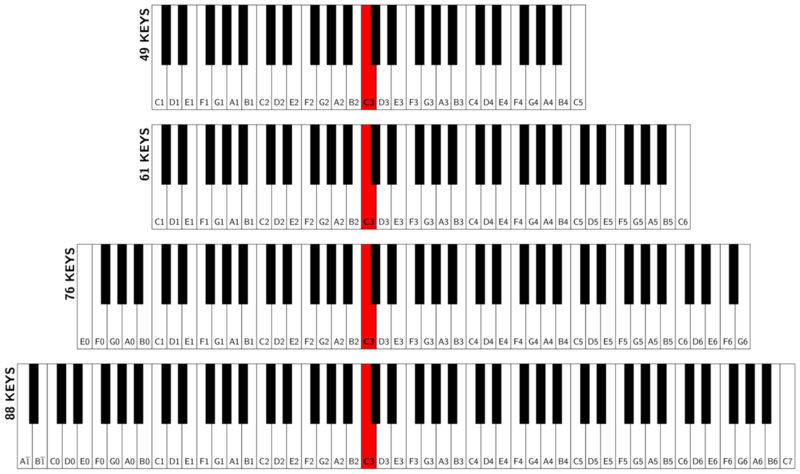 For the low notes (ottava -1 and 0), you mostly play only bass notes there, and frankly, not many people notice if you play them in the lowest ottava of your keyboard. I mean, you can shift the lowest notes up by 1 ottava in most cases. The number of keys is not everything. From the product website it is very questionable if CTK-1200 has velocity sensitive keys (nothing is written about) and also looks like it does not have any pedals even between optional parts. Your expression will suffer significantly with such a keyboard regardless of the number of keys. Thinking positively, maybe the keyboard can be a safe, cost efficient way to check if you actually like playing piano enough. The number of keys probably does not matter for that. After a year at most, probably earlier, the teacher will probably suggest you to buy a more high end instrument. Not the answer you're looking for? Browse other questions tagged piano keyboard or ask your own question. What kind of digital piano instrument should I look for when I like to play pop? Is my digital piano suitable for learning to play? Can I use a pedal for Casio CTK-1200 keyboard?